When the first settlers came to America they would clear the land by burning down trees.Then they would pull the stumps of the trees out by tying ropes around oxen and then the oxen would pull the stumps out.Then they would plow up all of the rocks and use them as fences. 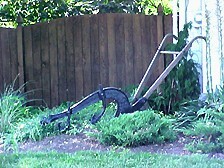 This hand plow now serves only as a garden decoration. 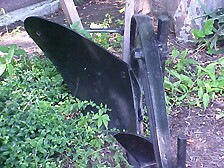 The plow itself has a "V" shape where it creates a wedge in the ground as it plows the soil. In the early years plowing and harrowing was done by hand or with oxen, mules, or horses. Today this work is done by machinery such as tractors. Fields were also planted and weeded (cultivated) with human and animal power. It took a person 90 minutes to sow an acre of wheat by hand. Special tools were designed to separate seeds as they were planted. Insects, weather, plant viruses and fungi cause difficulties in growing crops. Today farmers are not on their own as in the past; additional scientific support is available from the agricultural agents for farmers who have difficulties with their crops.